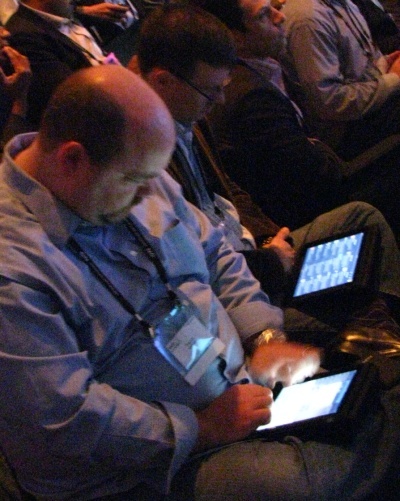 But after spending three days at a conference in San Francisco this week watching and talking to iPad users, I’m now convinced that tablets will all but displace laptops within the next few years. In short, tablets are built for what people want to do with a portable device, while laptops are essentially scaled-down desktop PCs. We’ve carried them for 20 years because they were what we thought portable computers should be. Now we know better. By “tablet,” I don’t mean “iPad.” Samsung just released the first Android tablet and we can expect many more to follow. We can also expect special-purpose devices like the Amazon Kindle to become more feature-rich over time. The difference between these devices and PCs is that they are designed specifically with the needs of the mobile user in mind. Laptops and the early versions of Windows tablets (the machines have been around for a decade), never were. As I sat in the outlet-deprived seats at the Web 2.0 Summit this week, I scanned the rows of iPad owners with envy. My Toshiba laptop gets less than two hours of battery life on its stingiest setting. It takes three minutes to start and its eight-pound mass is awkward, hot and uncomfortable. In contrast, the iPad’s battery life is conservatively rated at 10 hours. It starts in seconds and can easily be held with one hand or cradled in the nook of your arm. Apps start and switched quickly. It can be flipped vertically for book reading or horizontally for Web browsing. People say reading books and periodicals with Kindle and Nook apps on the iPad is nearly as good as reading on a Kindle or a Nook. There has been no innovation in laptops in more than a decade. Hardware makers have mainly crammed their devices full of storage and memory to the point of excess. My laptop has 300GB of disk storage. What the heck am I going to do with that? Tablets use fast, lightweight flash storage, which is why they start so quickly. Sure, there’s a lot less capacity, but how much do you really need for a couple of days on the road? I don’t have to carry all nine seasons of “24” in my briefcase. The primary advantage laptops is the keyboard, and even iPad fanatics will tell you that typing on a screen is neither as fast nor as tactile as using a keyboard. However, external wireless keyboards and voice recognition will quickly resolve tablets’ shortcomings in these areas. A decade from now, a new generation of youngsters will think it funny to hear daddy tell about how he used to skulk around airports looking for power outlets. We’ll probably think it’s pretty funny, too. Oppenheimer & Co. forecast this week that shipments of tablets will soar grow from 15 million units this year to more than 115 million in 2014. Oppenheimer knows what I learned in San Francisco this week. The laptop has had a long a fruitful run, but it’s time for that 1980s technology to wind down. There’s a new king in town. This entry was posted in innovation and tagged Android, iPad, laptops, tablets by Paul. Bookmark the permalink. Seriously though, I think late adoption has its benefits. Let the manufacturers of new devices first iron out the teething problems in their products (it’s a well-known fact that most shiny new things are introduced with some initial flaws) and let there be a big enough user base to make an educated decision (the early adopters’ reviews tend to be overly positive). I’ve also come to the conclusion that tablets are replacing laptops for on-the-road use. I’m not so sure about netbooks, though, at least in the short term. The main differences between tablets and netbooks is thickness and battery life. A tablet, like a netbook, requires a case to be carried around. One thing I’m hesitant about is the user interface. A B2B copywriter, my main input method is the keyboard. I type with all 10 fingers. In case the typing interface is at least decent, the usefulness rating of a device drops significantly. External keyboards are not a solution (you might as well use a netbook), neither is voice recognition (imagine 1,000 conference participants dictating their notes). I’m sure these concerns will be addressed in the coming generations of tablets. Which brings us back to the adoption issue: perhaps better later than earlier. You may safely discount what attendees of conferences display. They have forecast ten of the last one or two killer platforms. Far more compelling evidence that the “age of the Tablet” is here is to use one. It becomes immediately clear that this is a distinct (and superior) experience not comparable to either a smart phone or laptop. For quantitative evidence, Apple’s sales of five million iPads in half a year validate the category.